This model is based on a multitude of data collected over the last couple of decades, from the cosmic microwave background, or CMB – the first light in the history of the cosmos, released only 380 000 years after the big bang and observed in unprecedented detail by ESA’s Planck mission – to more ‘local’ observations. The latter include supernova explosions, galaxy clusters and the gravitational distortion imprinted by dark matter on distant galaxies, and can be used to trace cosmic expansion in recent epochs of cosmic history – across the past nine billion years. A new study, led by Guido Risaliti of Università di Firenze, Italy, and Elisabeta Lusso of Durham University, UK, points to another type of cosmic tracer – quasars – that would fill part of the gap between these observations, measuring the expansion of the Universe up to 12 billion years ago. Quasars are the cores of galaxies where an active supermassive black hole is pulling in matter from its surroundings at very intense rates, shining brightly across the electromagnetic spectrum. 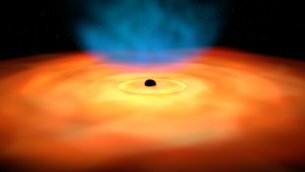 As material falls onto the black hole, it forms a swirling disc that radiates in visible and ultraviolet light; this light, in turn, heats up nearby electrons, generating X-rays. Three years ago, Guido and Elisabeta realised that a well-known relation between the ultraviolet and X-ray brightness of quasars could be used to estimate the distance to these sources – something that is notoriously tricky in astronomy – and, ultimately, to probe the expansion history of the Universe. Astronomical sources whose properties allow us to gauge their distances are referred to as ‘standard candles’. The most notable class, known as ‘type-Ia’ supernova, consists of the spectacular demise of white dwarf stars after they have over-filled on material from a companion star, generating explosions of predictable brightness that allows astronomers to pinpoint the distance. Observations of these supernovas in the late 1990s revealed the Universe’s accelerated expansion over the last few billion years. “Using quasars as standard candles has great potential, since we can observe them out to much greater distances from us than type-Ia supernovas, and so use them to probe much earlier epochs in the history of the cosmos,” explains Elisabeta. With a sizeable sample of quasars at hand, the astronomers have now put their method into practice, and the results are intriguing. Digging into the XMM-Newton archive, they collected X-ray data for over 7000 quasars, combining them with ultraviolet observations from the ground-based Sloan Digital Sky Survey. They also used a new set of data, specially obtained with XMM-Newton in 2017 to look at very distant quasars, observing them as they were when the Universe was only about two billion years old. Finally, they complemented the data with a small number of even more distant quasars and with some relatively nearby ones, observed with NASA’s Chandra and Swift X-ray observatories, respectively. “Such a large sample enabled us to scrutinise the relation between X-ray and ultraviolet emission of quasars in painstaking detail, which greatly refined our technique to estimate their distance,” says Guido. The new XMM-Newton observations of distant quasars are so good that the team even identified two different groups: 70 percent of the sources shine brightly in low-energy X-rays, while the remaining 30 percent emit lower amounts of X-rays that are characterised by higher energies. For the further analysis, they only kept the earlier group of sources, in which the relation between X-ray and ultraviolet emission appears clearer. “It is quite remarkable that we can discern such level of detail in sources so distant from us that their light has been travelling for more than ten billion years before reaching us,” says Norbert Schartel, XMM-Newton project scientist at ESA. After skimming through the data and bringing the sample down to about 1600 quasars, the astronomers were left with the very best observations, leading to robust estimates of the distance to these sources that they could use to investigate the Universe’s expansion. “When we combine the quasar sample, which spans almost 12 billion years of cosmic history, with the more local sample of type-Ia supernovas, covering only the past eight billion years or so, we find similar results in the overlapping epochs,” says Elisabeta. Looking into this previously poorly explored period of cosmic history with the help of quasars, the astronomers have revealed a possible tension in the standard model of cosmology, which might require the addition of extra parameters to reconcile the data with theory. “One of the possible solutions would be to invoke an evolving dark energy, with a density that increases as time goes by,” says Guido. Incidentally, this particular model would also alleviate another tension that has kept cosmologists busy lately, concerning the Hubble constant – the current rate of cosmic expansion. This discrepancy was found between estimates of the Hubble constant in the local Universe, based on supernova data – and, independently, on galaxy clusters – and those based on Planck’s observations of the cosmic microwave background in the early Universe. “This model is quite interesting because it might solve two puzzles at once, but the jury is definitely not out yet and we’ll have to look at many more models in great detail before we can solve this cosmic conundrum,” adds Guido. The team is looking forward to observing even more quasars in the future to further refine their results. Additional clues will also come from ESA’s Euclid mission, scheduled for a 2022 launch to explore the past ten billion years of cosmic expansion and investigate the nature of dark energy. “These are interesting times to investigate the history of our Universe, and it’s exciting that XMM-Newton can contribute by looking at a cosmic epoch that had remained largely unexplored so far,” concludes Norbert. 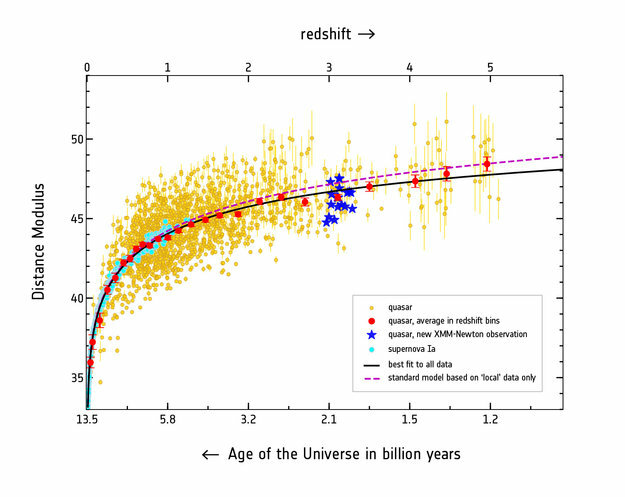 “Cosmological constraints from the Hubble diagram of quasars at high redshifts” by G. Risaliti & E. Lusso is published in Nature Astronomy.